Gastroesophageal reflux disease (GERD) is the most common GI disorder in the US. Ten percent of people experience symptoms of reflux weekly, and 20-40% of the population will suffer with symptoms over their lifetime. GERD presents with classic symptoms of heartburn and regurgitation, but sometimes can present atypically with cough, hoarseness, or even dental erosions. Untreated GERD can lead to esophagitis, strictures, Barrett’s esophagus and even esophageal adenocarcinoma. 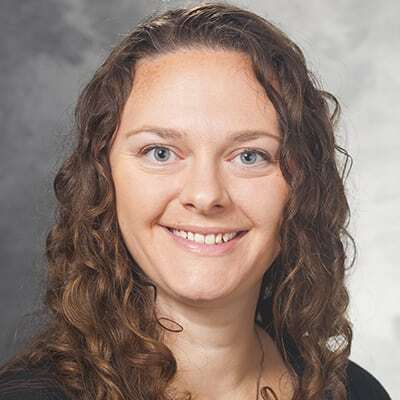 For many patients, lifestyle changes including weight loss, avoiding smoking and alcohol, and sleeping with the head of the bed elevated work well to manage GERD symptoms. For those with severe symptoms despite lifestyle modification, medical therapy including H2 blockers (ranitidine, famotidine, cimetidine) and Proton Pump Inhibitors (PPI, such as omeprazole, lansoprazole, pantoprazole, rabeprazole, dexlansoprazole) can control GERD. Proton Pump inhibitors are the mainstay of medical management of GERD. They are very effective at treating heartburn as well as esophagitis. However, because the principle problem in GERD is failure of the Lower Esopahgeal Sphincter to prevent refluxate from entering the esophagus, PPI therapy does not treat regurgitation very effectively. Furthermore, PPI therapy has been associated with osteoporosis and fracture, dementia, Clostridium Difficile infection, renal insufficiency, and myocardial infarction(2). And, up to 40% of patients who take medication for GERD have incomplete symptom control, particularly with regurgitation(1). Additionally, some patients are not able to tolerate the gastrointestinal side effects of PPI therapy(2). Surgical therapy for GERD is indicated in patients who have failed medical management with PPI therapy. Others may be unable to tolerate PPI therapy due to side effects or complications. In particular, those with uncontrolled GERD who have end organ damage such as stricture, esophagitis, or Barrett’s esophagus may be good candidates for surgical treatment of GERD. This chart details the appropriate work-up for patients with GERD. 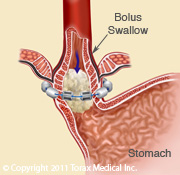 The fundoplication is the traditional surgical treatment for GERD. It is very effective when performed correctly and for the proper indication. Unfortunately, fundoplication comes with side effects including bloating, inability to vomit, and flatulence. This has led gastroenterologists to avoid referring patients for consideration of antireflux surgery. Fundoplication is almost always done laparoscopically. It requires general anesthesia and an overnight hospital stay. Most patients are off of work 2 weeks. It is indicated for patients with GERD refractory to medical management. It is most effective in patients with a Body Mass Index of less than 40. While the literature reports a wide range of success in getting off of PPI, most studies report >80% success in stopping PPI therapy long-term after fundoplication. Long-term satisfaction with fundoplication for GERD is typically >90%(3). 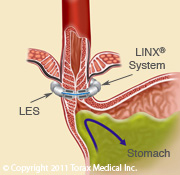 The LINX reflux management system is an alternative to fundoplication to treat refractory GERD. The LINX is a magnetic ring of titanium coated neodymium magnets that is placed around the LES. It functions to augment the LES and prevents reflux in patients with GERD. The LINX is placed as an outpatient laparoscopic procedure. It requires less dissection and reconstruction than a fundoplication, and thus has fewer side effects such as bloating. Five-year studies of the LINX device find that 85% of patients are off of their PPI and only 1% of patients have regurgitation(4). Over 10,000 devices have been placed thus far. The Society of Gastrointestinal and Endoscopic Surgeons feels that the LINX is a reasonable option in appropriately selected patients and is part of the armamentarium in treatment of GERD(4). Our group of esophageal and gastric surgeons specialize in advanced minimally invasive treatments of foregut diseases including GERD, Motility disorders, and Hiatal hernias. We provide state of the art surgical treatments for GERD, and specialize in complex esophagogastric and revisional foregut surgery. We have a regional esophageal testing laboratory that provides flexible upper endoscopy, high resolution esophageal manometry, Impedance testing, and traditional and wireless pH testing. You can refer patients to our team of esophageal and gastric surgeons by calling 608-242-2898. 3. Stefanidis D, Hope WW, Kohn GP, et al. SAGES guidelines for surgical treatment of gastroesophageal reflux disease. Surg Endosc 2010;24(11):2467-69. 4. Telem DA, Wright AS, Shah PC, et al. SAGES terminology and value assessment committee (TAVAC) safety and effectiveness analysis: LINX reflux management system. Surg Endosc 2017;31(10):3811-26.